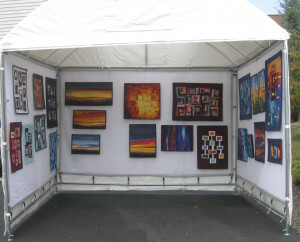 First, I invested in a Trimline tent when I decided to do festivals. Everything I read about people who bought EZ Ups was that they ended up buying a better quality tent in a year or two. I needed a hanging system so I invested in a great quality tent and have never regretted it. 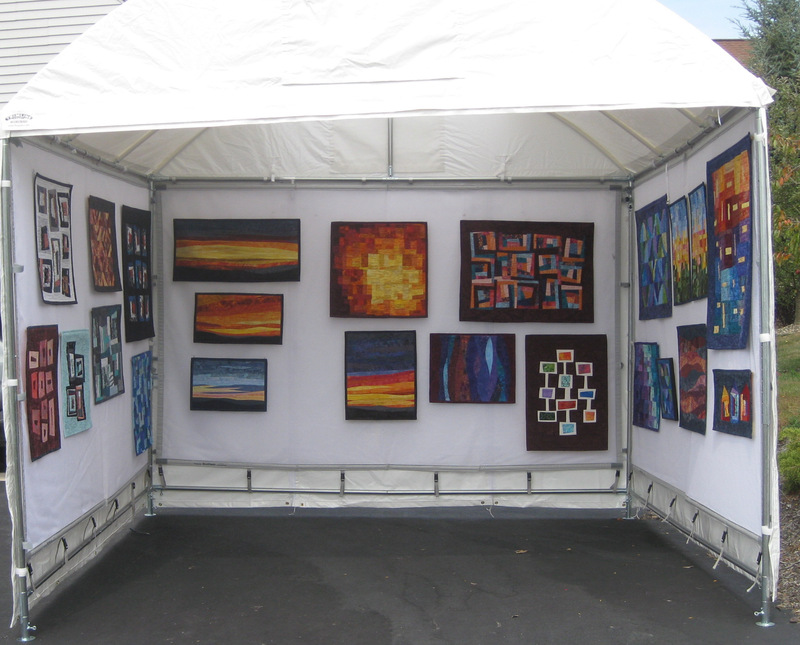 I use mesh walls which are easy to hang my quilts. Sometimes I use clear plastic twist ties through the holes of the mesh, twisted on the outside to hold the dowels tight against the mesh walls. Other times if set up is such that you can’t walk between the sides of your canopy and your neighbor’s canopy, I use safety pins discreetly on the top corners on the back of the quilts with hooks for the mesh. The first year we were just happy to remember how to put the canopy up and take it down without bodily injury!! The second year I made some organizing and carrying slings for various parts of the canopy. See the picture of the simple sling wrap I made to more easily carry the folded canopy top. I made a bag for the canopy sides to keep them together and easy to lift and pack. The heavy metal poles were making me nuts so I separated them into manageable groups and made denim sling wraps for them too. 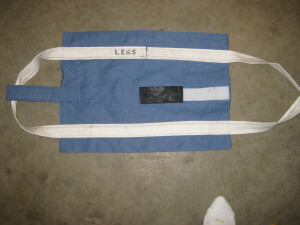 See the picture of one of these slings. I think I have about 6 or 7 slings for different groups of the metal frame poles. These simple organizers make all the difference when packing and moving all the festival stuff around. This winter I decided to tackle the problem of storage of the quilts which were not on display. I have about 4 or 5 very large bins into which I put groups of about 6 quilts wrapped up which keeps them smooth and safe. Each bin can pack about 3 rolls of 6 quilts. This is an easy way to travel but during a festival, pulling quilts out of the bins, unwrapping to find the quilt I want to put on display (as quilts are sold new ones go up), rewrapping, etc….well, you can see it is cumbersome. I end up with quilts all over the place and nothing is kept nice! 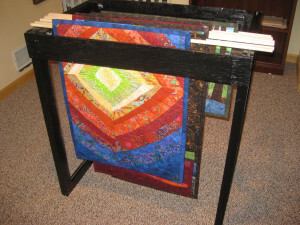 This winter my husband and I made a display stand on which I can hang all but my very largest quilts. This stand will hold about 30-40 quilts. Right now I’m planning to keep this rack behind by booth where I can easily pull out a new quilt to replace a sold quilt. I may at some point consider using this as part of my display for the quilts for which I don’t have wall space. A 10′ x 10′ canopy is small and I usually have room for about 20-22 inside. If I’m lucky with set up location, I can sometimes also display quilts on the outside sides but so far that has only happened in one festival location so I don’t count on it. Anyway, back to the home made rack. WE are not carpenters!! This project was our upper limit of carpentry so we kept it very simple. 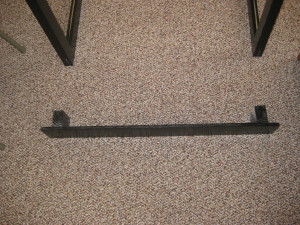 I bought two canvas stretcher frames, very heavy duty, which were 36″x20″. We used those for the sides. We made two cross pieces (see photo) which are 33″ long and about 5″ wide for the top front and top back which bolt into the frame. So we have 4 pieces and 4 bolts, nuts, and washers. I have several pictures included of the frame and its pieces. It uses a footprint of about 33″ x 21″ which is nice and compact. 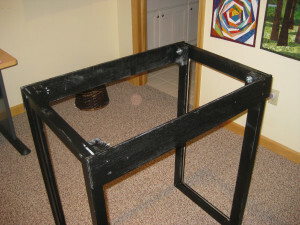 At night after festival hours I will put this frame and all the quilts inside the canopy for quick and easy storage. My first festival is April 25th and I’m looking forward to trying it out in real time!! 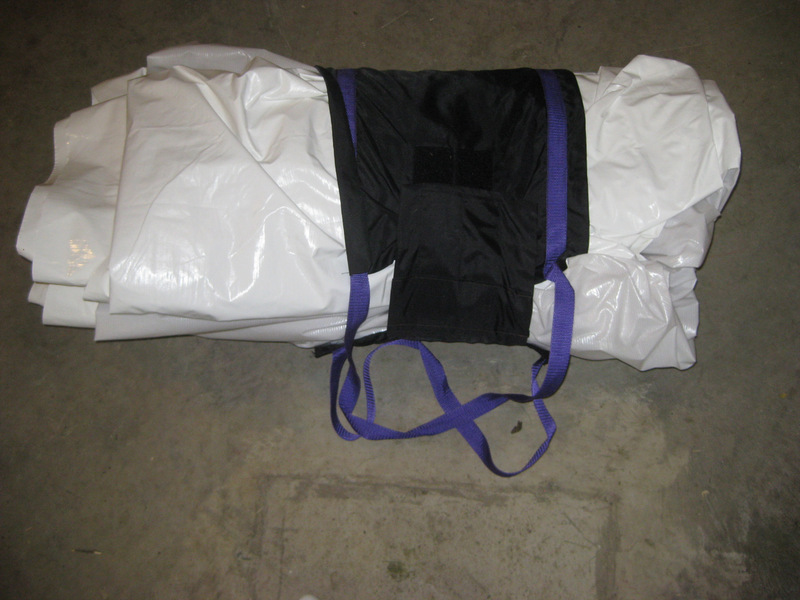 Today’s job is to make a drawstring bag for the frame pieces and a Velcro closing pocket for the nuts and bolts. I’m planning more blogs on festival prep as the season gets started for me.